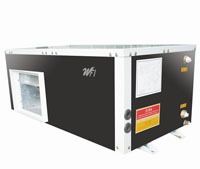 increase the cooling efficiency of heat pump unit. The EER can reach over 4.0. The operation fee is 40%-50%lower than the ordinary air conditioner. open/opposite phase protection etc. to ensure the reliant operation of the cooling system. factory. The unit can detect the water temperature and adjust it automatically. The user should only turn on theunit, allthe operation will be done by the unit automatically.